Dr. James Webb was honored with a 2012 Profile in Excellence Award by the alumni association of his alma mater – Oklahoma Baptist University. Dr. Webb graduated from OBU in 1995. Recipients of the award are featured in the OBU Magazine. Most radiologists sit in a dark room reading X-rays, CT scans, MRIs and ultrasounds all day. Many interventional radiologists focus on image-guided minor procedures with general diagnostic imaging. Pain doctors administer epidural injections and other pain medicine. 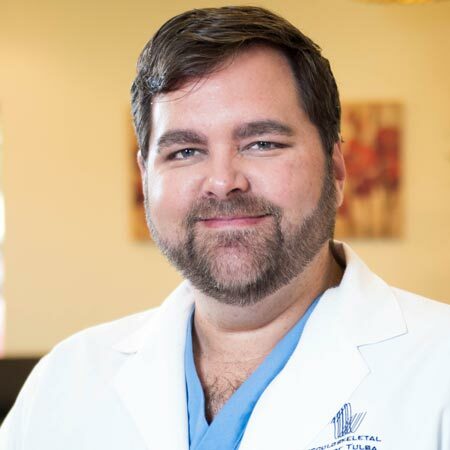 Dr. Jim Webb, a 1995 OBU graduate, combines the work of those three medical specialists at his hybrid practice, Musculoskeletal Imaging of Tulsa. He brings expertise to read MRIs and other scans to find a diagnosis, and then he performs the procedures to help his patients, whether through interventional pain management or minimally invasive spine surgery. “I take the 10 percent of pain patients that are difficult for other doctors, and that’s 90 percent of my practice,” Webb said. “I get to see patients who have dealt with pain for decades that we’re able to help. Read more in the original article at OKBU.edu.